You could still see piled up snow on the sides of the pavements even in the middle of Tokyo now from the terrible snow last Friday but they are starting to dissolve from the warm sunshine in the daytime. You could see that small streams flowing from these melting piles run into the drainage ditch in the cities but in the nature they would filter into the soil, like the blood flowing in the blood vessel, deep into the ground. The frozen water in the shallow layers of soil would also start to melt, gradually flowing together with the running melted snow and ice from the surface because of the temperature rise. Today’s phrase of the season expresses the vein of water deep into the ground, underneath. The first word, ‘Tsuchi-no-shou’ means the vessel of the soil which is expressing the water veins made from the melted water which runs down deep into the ground. During the cold days, the grounds have been frozen, stiff and hard with the water content within the soil but with the seasonal temperature rise, the water gradually melts and forms water veins beneath the ground. The next verb conjunctive form word, ‘uruoi’ means moisture, followed by a verb ‘okoru’ meaning to happen, leaving us with ‘the moisture happens’. Therefore, the whole phrase would be; the vessel of the soil happen to moisten, meaning that the frozen soil of the ground starts to melt, moistening and softening the ground, telling us that the frozen ground starts to warm not only by the heat of the earth but also by the warm sunshine of early spring. 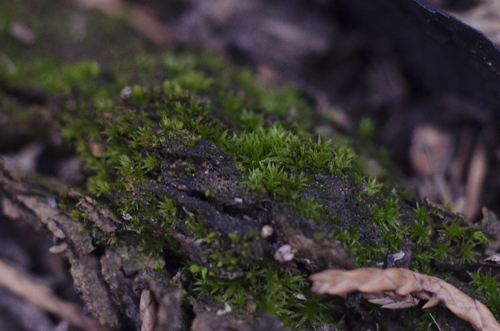 Frozen ground gradually melts and starts to moisten the soil…. 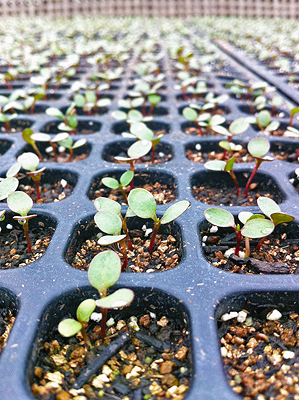 Japanese indigo, Ai, sprouts. Photo from ‘Ai-iro koubou Official Blog‘, an Ai farm which produces also Ai dyed goods. ‘Ai maku’, meaning sowing the Japanese indigo seeds, is a phrase of the season expressed in Japanese classical poetries pointing this time of the year though the actual sowing of Japanese indigo shifts to later time because of the calendar change from Lunisolar to Solar calendar which we use now. Japanese indigo (Persicaria tinctoriaW) has been one of the oldest vegetable dyes used in Japan from Nara periodW. The technique of indigo dye from the Japanese indigo plant were brought from China which the indigo cultivation spread throughout Japan. It was in Edo periodW that Awa provinceW, today a part of Tokushima prefectureW, which brought out wealthy merchants of Japanese indigo with the largest production output. Tokushima Plain is still famous for Japanese indigo though the indigo farmers became less after indigo import from India and artificial indigo dyes. ‘Ai, Japanese indigo known also as ‘Japanese Blue’ or ‘Hiroshige Blue’ was used as dying ramieW and other fibers woven into fabric for clothing and housing interiors including those of shrines’ and temples’. The ‘Ai’ coloured clothes were first worn by the nobles on their outing, such as hunting, which in later periods, were worn by guards and bushiWs’ uniforms of the Imperial Court, called ‘kachi-e’, as the nobles had finer fabrics than ramie fabrics. ‘Ai’, #165e83 in web colour. ‘Kachi-iro’, #4d4c61 in web colour. The colour of ramie fabric made clothes for the guards and early period bushis dyed in Ai was called ‘kachi-iro’ (meaning kachi colour). Because the fabric had to be stroked to soften and to give shine to the fabric surface, it is thought to be of this striking procedure which was called ‘katsu’ that became the origin of the naming of the colour, ‘katsu / kachi’ + ‘iro (colour)’. 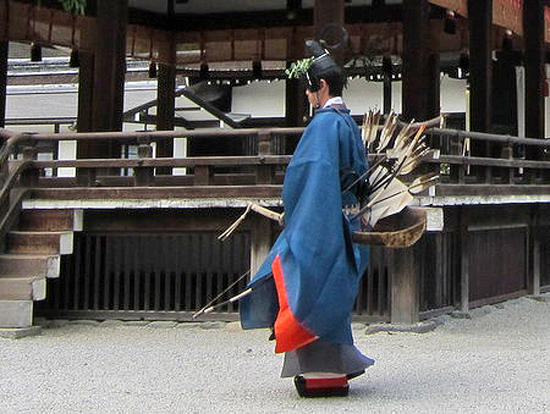 A man dressed up in ‘Kachi-e’, a classical outfit of the Imperial Court guards in ‘ai’ and ‘kachi-iro’ blue. Photo from ‘Kimono Cantabile‘. 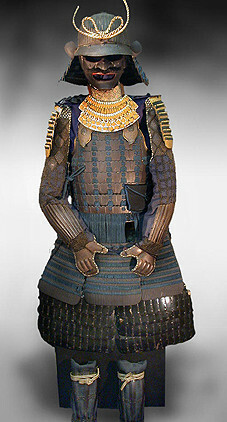 An armor of Sengoku period. You can see the armor plate joining cords dyed ‘kach-iro’. Photo from ‘Gallery Samurai ‘. Of course, Ai was used as various colour dyes of blue but in Kamakura periodW when bushis came to force, the ‘kachi-iro’ dyed ‘kachi-e’ were favoured because the word ‘kachi’ has the same pronunciation as the Japanese word ‘to win’. There are still some armors from Sengoku periodW remaining which could be seen in some museums and castles all over Japan with joining and decoration cords or underwear dyed in the colour of ‘kachi-iro’. Whether it is true or not as it is not announced officially, the uniform of the national football team of Japan is in blue called ‘Samurai blue’ which may have come from the Ai dyed traditional colour, ‘kachi-iro’. Japanese indigo, Ai was a popular dye even in the time of peace in Edo period. KimonoWs, YukataWs and other domestic fabric were dyed in Ai. Japanese indigo blue must have been occupying the colour in public as you could see the blue used in one of the famous UkiyoeW artist, Utagawa HiroshigeW’s works, now known as ‘Hiroshige Blue’ and those you still see many in traditional Japanese goods. 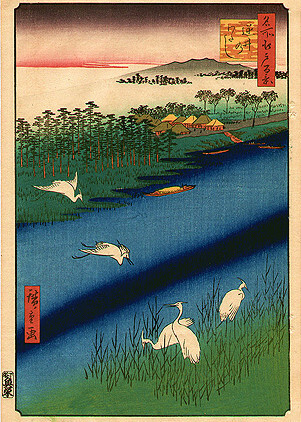 Hiroshige-blue seen in “Meisho Edo Hyakkei – Sakasai no watashi’.